Is red your favorite color? Do you, more often than not, find yourself on the short end of your temper? Is croquet your favorite pastime? If you've answered yes to any of these questions, then you may be ready to ascend the throne as the royal queen! If people are always telling you that you act like a queen or that you ride on your high horse, then being a true ruler should be no big task! You’ll enjoy commanding attention and respect everywhere you turn, even if it’s just respect driven out of fear of being called out by your royal highness. If you prefer the company of ‘yes’ men and women, then being queen is a job you’re surely up to the task for. Sure, we all enjoy being told the truth, but sometimes just having people around you who will do as you ask is nice too! 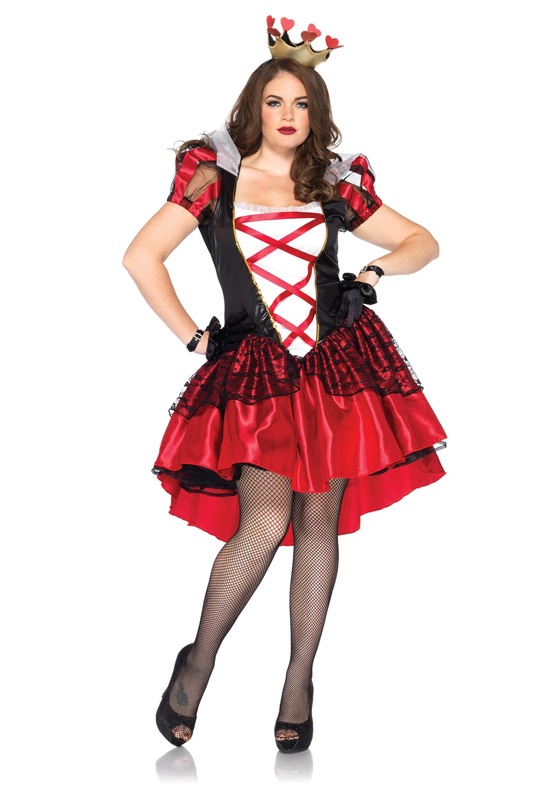 Rule Wonderland with a firm hand and a killer sense of style in this regal costume! This regal costume comes with all of the items you need to make a grand entrance this Halloween! The high-low dress has cupcake sleeves and is made of 100% polyester. The faux corset front has a high collar for added dramatic effect and the dress has ample decorative lace and sequins. The gold and red heart crown give you an unmistakable look that will strike fear into those who would challenge you. The crown opens with Velcro and attaches with bobby pins for a look that will last throughout your entire evening. Add a pair of red or black heels as well as a queen’s staff to give you a look that will demand respect and loyalty this Halloween. Otherwise, it’s off with their heads! Please feel free to reach out to the friendly folks in our customer service department. We would love to help!